Thanks to NetGalley and Entangled Publishing for providing an eARC in exchange for an honest review. Rain Ryland has never belonged anywhere. He’s used to people judging him for his rough background, his intimidating size, and now, his orphan status. He’s always been on the outside, looking, in, and he’s fine with that. Until he moves to New Wurzburg and meets Friederike Burkhart. Haven is definitely going down as one of my favorite YA novels of 2017! It’s a unique and refreshing take on werewolf, witches and vampire lore, that hands down, beats anything else out there. I was hooked from the very first page and while I finished it in one sitting, I was sad when the ending came. The relationship between Rain and Freddie is so gorgeously written. They’re strong personalities that both have dark pasts, and watching them learn to trust each other and then fall in love is both beautiful and heartbreaking. Their courtship is not a smooth one as they have many things stacked against them, but there is no doubt that these two are destined to be together. There is a large cast of secondary characters and they’re all just as fantastically written as Rain and Freddie. There’s two in particular that I loved. Rain’s Aunt Ruby, who lovingly welcomes him into her home after his mother died, and Petra, a Weaver and so-called “freak” who is quirky and surprisingly strong given the way she’s treated by the rest of the community and her own family. The world-building and backstories of the Weavers (magic users) and Watchers ( werewolves) is dark, dense and gritty, and it amazed me how much the author was able to pack in a book that was slightly less than 400 pages. The whole story plays out as almost a Grimm’s fairytale only it’s set in a small Texas town. Honestly, I could keep gushing about Haven all day, but I’m going to sum it up in two words: sheer perfection. This is one of the best YA paranormal romance/urban fantasies I’ve come across and in my humble opinion it even eclipses Stephenie Meyers Twilight. I do have one word of caution. There are some fairly graphic sexual scenes as well as some gory ones, so I’d recommend this for ages 16 and up. I’m hoping this is only the first book in a future series, because I want MORE! Thanks to NetGalley and Diversion Publishing for providing an eARC in exchange for an honest review. Synopsis: After a relationship gone bad in California, Kylie Strange moves to rural Maine for a fresh start. But she gets more than she bargained for when she finds a supernatural book bricked into the wall of her new tea shop, Strange Herbs and Teas. As soon as she opens the Booke of the Hidden, the quiet town of Moody Bog suddenly becomes a lot more interesting. First the mysterious and handsome Erasmus Dark shows up unannounced, claiming to be a demon and warning Kylie of untold destruction. She waves him off, until a museum proprietor turns up dead, and the sheriff targets Kylie as a suspect. With the help of Erasmus and a ragtag group of local Wiccans, Kylie unravels the Booke’s secrets, and they begin to believe the culprit is someone—or something—much more sinister than a run-of-the-mill human murderer. Booke of the Hidden is the first book in a new urban fantasy series, and while I found the romance to be a little “meh”, I still really enjoyed it. I loved Kylie who’s spunky and sassy and all those other things you like to see in a heroine. Erasmus, the demonic romantic lead is tall, dark and dangerous, and literally smolders. That’s why I was surprised there didn’t seem to be more sparks between the two of them. There’s also the beginning of a love triangle between Kylie, Erasmus and Ed, the sheriff of Moody Bog, but you can already tell that this series is most likely going to focus on the forbidden romance between Kylie and Erasmus. The secondary characters, namely the small coven who become Kylie’s friends and support team are fantastic and just as interesting as the main characters. The dialogue between everyone in this story made me laugh out loud more than once, in a good way of course! At the beginning I had a difficult time visualizing a quaint little town in Maine being an epicenter for paranormal activity, but the author does a fantastic job detailing the town and it’s history. The action is pretty fast paced and the ending perfectly sets things up for the next book. The Booke of the Hidden is a fun urban fantasy with tones of a cozy, that kept me thoroughly entertained from beginning to end. I’m hoping the romance between Kylie and Erasmus is developed more in the sequel, but otherwise I highly recommend this to fans of these genres. Synopsis: Ever since Reyes escaped from a hell dimension in which Charley accidentally trapped him, the son of Satan has been brimstone-bent on destroying the world his heavenly Brother created. His volatile tendencies have put Charley in a bit of a pickle. But that’s not the only briny vegetable on her plate. While trying to domesticate the feral being that used to be her husband, she also has to deal with her everyday life of annoying all manner of beings—some corporeal, some not so much—as she struggles to write the wrongs of society. Only this time she’s not uncovering a murder. This time she’s covering one up. Add to that her new occupation of keeping a startup PI venture—the indomitable mystery-solving team of Amber Kowalski and Quentin Rutherford—out of trouble and dealing with the Vatican’s inquiries into her beloved daughter, and Charley is on the brink of throwing in the towel and becoming a professional shopper. Or possibly a live mannequin. But when someone starts attacking humans who are sensitive to the supernatural world, Charley knows it’s time to let loose her razor sharp claws. Then again, her number one suspect is the dark entity she’s loved for centuries. So, the question becomes, can she tame the unruly beast before it destroys everything she’s worked so hard to protect? I never said I would die without coffee. I said others would. If you’ve been following me for a while, you probably know how much I LOVE the Charley Davidson series. So, I immediately jumped as soon as I saw The Trouble With Twelfth Grave offered on NetGalley. And I have a feeling that my entire town heard my shrieks of happiness when I was approved. So, did it live up to my high expectations? HELL YEAH! Before I start, let me warn you that this is definitely NOT a series you can jump into the middle of. If you try, you will be completely lost. Picking up where the last book left off, Charley is her usual snarky, sassy, lovable self, and each chapter has a “Charleyism” saying like the one above. She’s working multiple cases while trying to deal with the downward turn her life has taken. Not only is she missing her baby daughter who remains hidden because of the evil who’s after her, but now her beloved and incredibly hot husband Reyes, is, well, let’s just say he’s not himself. Thank goodness she has her trusty back up team to help and support her. Her friends and family are incredible, and as formidable as Charley is, she would be lost without them. The Trouble With Twelfth Grave is another fantastic entry in the Charley Davidson series and is sure to please fans of this popular series. It ends with a huge cliffhanger which has left me both longing for and dreading the release of the final book next October. Synopsis: First kisses should be legendary–not deadly. Kiss Me, Kill You, isn’t an especially memorable YA paranormal romance, but it was a quick, enjoyable read nonetheless. Emmy is a humorous and sweetly innocent character. She’s a bit naive, socially awkward, and not really comfortable in her own skin, and that’s before she finds out she’s a succubus. When boys suddenly start showing an interest in her she doesn’t understand why. Luckily, she has Paul to look out for her, although he’s not altogether truthful with her at the beginning which puts her in danger. Once the two of them are together though, their romance is adorable. Given that this is a book about paranormal entities who feed off others sexual energy, the story is pretty clean. Discovering she’s a succubus doesn’t go over well with Emmy, especially since she’s in love with Paul, but has to feed from different partners. None of the scenes are particularly graphic and I’m impressed how the author was able to successfully gear this toward teens. I did think some of the secondary characters and the supernatural world-building needed a bit more development. Perhaps if it had been a little longer, these issues would have been resolved. Overall, I quite enjoyed Kiss Me, Kill You, and I think it would be a light and fun read for teens who love paranormal romance. Thanks to NetGalley and St. Martin’s Griffin for providing an eARC in exchange for an honest review. Synopsis: A typical day in the life of Charley Davidson involves cheating husbands, missing people, errant wives, philandering business owners, and oh yeah…demons, hell hounds, evil gods, and dead people. As a part time Private Investigator and full time Grim Reaper, Charley tries to balance the good, the bad, the undead, and those who want her dead. In this eleventh installment, Charley is learning to make peace with the fact that she is a goddess with all kinds of power and that her own daughter has been born to save the world from total destruction. But the forces of hell are determined to see Charley banished forever to the darkest corners of another dimension. With the son of Satan himself as her husband and world-rocking lover, maybe Charley can find a way to have her happily ever after, after all. God I love this series! This is the eleventh book in the Charley Davidson series, and it still shows no signs of running out of steam. Seriously–I’m adding Darynda Jones to my list of authors I’m stalking. Um, not that I have such a list! I never said I’d die without coffee. I said others would. But it’s not all fun and games for our sassy heroine and her loyal crew. As the series continues, each book has gotten progressively darker with more at stake. But Jones consistently and brilliantly balances these darker themes and events, with much need moments of levity. The story arc has also gotten increasingly complex. I’m determined to not include any spoilers but in this book alone there are: demons (both good and bad), hellhounds, ghosts, gods, angels and evil religious cults. I’m probably missing something, but I’m sure you get the picture. There is so much going on that by the end of the book I was exhausted, but in a good way. I’m always amazed at Jones’ adeptness at juggling multiple storylines. Charley’s relationship with her husband Reyes continues to be front and center of the story and their chemistry continues to sizzle, although in this latest installment they were bickering quite a lot in the first part of the book, which I didn’t like and there continues to be a lack of communication between them, although they do address this midway through the story. I’m hoping this this ceases to be a problem in future books because it does get irritating at times. The supporting cast, as always is phenomenal with Cookie, Uncle Bob, and Amber being the focus of much of the story. The ending is a huge cliffhanger which has left me anxiously anticipating the next installment, The Trouble With Twelfth Grave which fittingly is set for release on Halloween. If you’re already a fan of The Charley Davidson series, Eleventh Grave in Moonlight will not disappoint. If you’re a fan of urban fantasy and paranormal romance but haven’t tried this series yet, c’mon! What are you waiting for? I promise you’re going to love it! Thanks to NetGalley and Entangled Teen Crave for providing an ebook in exchange for an honest review. Synopsis: Aster Layne believes in physics, not psychics. A tarot card reading on the Ocean City Boardwalk should have been a ridiculous, just-for-fun thing. It wasn’t. Aster discovers she has a very unscientific gift–with a simple touch of the cards, she can change a person’s fate. Reese Van Buren is cursed. Like the old-school, centuries-old curse that runs in royal families. Every firstborn son is doomed to die on his eighteenth birthday–and Reese’s is coming up fast. Bummer. He tries to distract himself from his inevitable death…only to find the one person who can save him. But worst of all…she doesn’t know that her gift comes with dark, dark consequences that can harm everyone she loves. Touching Fate is a quick but enjoyable read that is also a very original twist on the power of tarot cards. I loved the story itself which combined tarot card reading with the Fates. You see, Aster Layne is a Fate Changer, which means she can change someone’s fate simply by touching a card in her deck. However, there’s also some repercussions from doing this which forces Aster to make some difficult decisions, including whether or not she can save Reese. The story alternates in the third person voices of Aster and Reese. I had a little bit of a hard time connecting to Aster at first because I felt her nastiness to Reese when they first met unwarranted. As this is a fairly short story, that didn’t last long, and I appreciated what she was going through. She loves pretty much unconditionally and will do anything to protect the people in her life. Reese is charming from the very first scene, and once he discovers Aster could lift the curse and save his life, he faces his own moral dilemma. While they fall in love fairly quickly, the secrets they keep from each other threaten to tear them apart…permanently. The secondary characters are equally engaging and each has a role that further fleshes out the story. My only complaint is that I felt the book could have been longer. Because it was only a little over 200 pages, everything unfolded a little too quickly. It was almost akin to a really fast roller-coaster ride. You feel like you just got on when the ride’s already over. The plot unfolds over the course of a year, but because of the shortness of the book, it really doesn’t feel like it. I also thought the relationship between Aster and Reese, although sweet and romantic, could have used a little extra time to develop more fully. But overall, I really enjoyed this, and I’m looking forward to reading the sequel Cursing Fate which is coming out later this month. I definitely recommend this for older teens who like paranormal romance. Thanks to NetGalley and BookLogix for providing an eARC in exchange for an honest review. Synopsis: Recurring dreams have plagued Katie Hammond since childhood, forcing her to keep an open mind to the paranormal. But when Katie is compelled to follow a forest path during her trip to the Blue Ridge Mountains, she stumbles into a forgotten life–one she’s not sure she wants to remember–and an enthralling man who shouldn’t exist. At the end of the path is Marcus Hillyerd, a man with a life-changing secret and mysterious golden eyes. After his uncle is killed in a suspicious accident, Marcus travels to the mountains to re-inherit the Hillyerd Estate. But Marcus is met with a new challenge and must come to terms with sharing his secrets when he comes face-to-face with the only woman he’s ever loved. The only problem–she doesn’t remember him. Is that or is that not a lovely cover? I’m putting the blame for me jumping and requesting Eyes Of Autumn before discovering that it’s the second book in a series squarely on that cover! Thankfully everything worked out because this can definitely be read as a standalone. I have to admit when I first started reading I found the pace a little slow and the writing a bit awkward. There are these huge chunks of dialogue with very little descriptive sentences to break them apart, but after the third chapter this thankfully stopped. The other problem I ran into was with Katie who came across as a little too passive and accepting. I liked her but for someone who previously had no inkling of reincarnation, she’s a little too accepting of Marcus and his explanations. Through much of the book I found myself wishing for some more emotion from her and less passivity. Marcus and the rest of the team more than make up for that though. Marcus is definitely an alpha male, but he has quite a few sweet moments with Katie so his fierceness never gets overwhelming. The secondary characters are equally interesting and endearing and I found myself just as emotionally invested in them. The story itself had so much going on with all the different supernatural/paranormal aspects but it was tightly written and maintened its fast pace right up until the cliffhanger ending. To give you an idea of how much I enjoyed this book despite the couple of issues I had, as soon as I finished I went on Amazon and bought the first book in the series, Portrait Of Rage. I highly recommend Eyes Of Autumn to fans of paranormal romance and urban fantasy. It has me looking forward to seeing what the third book will hold. Thank you NetGalley and Forever, for providing an e-ARC in exchange for an honest review. Synopsis: Miss Layla Starling, the young, beautiful, and extremely wealthy heiress, is the talk of London. Until now, she’s managed to evade the marriage noose. Despite the fact that that she is unfortunately an American, she’s received a staggering number of offers. And turned down every one. St. John Evernight does not want to admit the relief he feels every time he hears that she’s rejected one of her suitors. Which is unfair of him. Layla deserves to be happy. But he can not offer her happiness. He will never be normal, never be anything but a freak in her world. So St. John resolves to keep his distance, until he is recruited by the Society for the Suppression of Supernaturals to guard Layla. For she is in grave danger, and he’s about to learn the full extent of his powers. I can’t believe after four years my favorite historical romance/urban fantasy series has come to an end. I’ve been a devoted fan of Kristen Callihan since her first book, Firelight, was published, and subsequent books proved that she could be relied on for incredible storytelling. I became completely attached to the characters in this magical world she created, so you’ll have to forgive me. It’s difficult to let go. As I started reading Forevermore, it was with mixed emotions. I was anxious as to how everything was going to come to an end. Yet at the same time I was looking forward to another enthralling read, and as usual the author did not disappoint. I’ve been looking forward to Sin’s story for a while now and I think Callihan made a wise choice ending things with him. He’s such a sympathetic character that you can’t help but become emotionally attached. He’s a tragic sort of hero, in as much as all the heroes in the Darkest London series are, but I think out of all of them Sin is now my favorite. The author always does a wonderful job matching up her romantic couples, so it’s not a great surprise that Layla is the perfect match for sin. She’s sweet, fierce and loyal to a fault, and does whatever it takes to protect her loved ones. The romantic scenes between her and Sin literally sizzle off the pages. And well before the exciting conclusion, all of the characters from the previous books come back to assist in this final battle against evil. There are a couple of subplots involving Augustus, Layla’s guardian, and Archer, whose story kicked off the series. With these and all of the previous players returning, their intertwined pasts and Augustus’s hidden role in their lives are completely revealed. The only isue I have is that I think the final battle is a bit rushed. But honestly, with everything else going on this is a minor flaw. If you’re a fan of the Darkest London series and are anxious about how it all ends, you have nothing to worry about. It’s a spectacular finale to this wonderful series. And if you haven’t tried these books and you love steamy historical romances mixed with urban fantasy and the paranormal, I beg you to try these. I promise you won’t be sorry! Now, if you’ll excuse me, I must go find some Kleenex. Thank you NetGalley and MIRA for providing an e-Arc in exchange for an honest review. Synopsis: Restoring lost and abandoned cemeteries is my profession, but I’m starting to believe that my true calling is deciphering the riddles of the dead. Legend has it that Kroll Cemetary is a puzzle no one has ever been able to solve. For over half a century, the answer has remained hidden within the strange headstone inscriptions and intricate engravings. Because uncovering the mystery of that tiny, remote graveyard may come at a terrible price. I requested The Visitor from NetGalley because just reading the synopsis gave me the shivers. I didn’t realize that it’s the 4th book in an ongoing series, but thankfully it’s so well-written I had no problem following the story. Amelia Gray restores neglected and abandoned cemeteries. While she doesn’t actually do much of that in this novel, the author still drops in some interesting tidbits. For example: Did you know that there are headstones that have secret compartments in them in order to hide valuables? Adding to her interesting profession, Amelia can also communicate with spirits, an ability that’s been passed down through her family. From some references to events in previous books, it seems as though Amelia’s abilities are expanding, so she’s trying to deal with this, solving the mystery at the heart of this book (which also winds up having personal ties to her), and saving the rather complicated relationship she has with Detective John Devlin. It’s their romance that keeps me from giving this 5 Stars. Both Amelia and Devlin have very strong personalities but at least in this book they don’t seem to compliment one another. It’s obvious that they’ve been through some otherworldly stuff together, yet Devlin for almost the entire story refuses to acknowledge the possibility of any explanation beyond the ordinary. It’s mentioned that he’s been somewhat traumatized by something that happened at a cemetery in the previous book, but his repeated denials grew a bit wearying. The couple also keep secrets from one another for the majority of the story, further complicating an already complex relationship. But they’re both such likable characters and their chemistry is undeniable, so this one flaw didn’t majorly detract from an otherwise perfect tale. The ending nicely sets things up for the next book in the series, The Sinner which is due out later this year. The Visitor is an atmospheric and addictive mystery that had me finishing it in one sitting. Amanda Stevens has a beautiful and edgy writing style and includes some fantastic twists and turns that reach some pretty surprising conclusions. I highly recommend this to anyone who likes their mysteries mixed with the supernatural as well as some sizzling romance. Just make sure you read the previous three books first, because I think that will add to your enjoyment. It seems as though there may be a tv series in the works which has me quite excited. In the meantime I’m going to go catch up with the rest of the books in the series. I received this ebook from NetGalley and St. Martin’s in exchange for an honest review. Synopsis: Abandoned as an infant, Willow Black spent her childhood in foster care, the object of whispers and pity…and rumors about bring certifiably crazy. Telling people that you can foresee the future–and summon the rain– is a surefire way to end up in the psychiatric ward. But when Dr. Sebastian Frasier arrives at the facility, Willow’s whole life takes a turn. Sebastian is the handsomest man she’s ever actually laid eyes on–even though he has been in Willow’s visions for years. But not even she could have predicted the storm of passion that engulfs them both. With Sebastian by her side, Willow is emboldened to embrace her history, and the sisters she never knew. Soon the true power in her blood awakens and the battle she was born to fight begins. While the tempest rages, Willow must depend on the family and friends she’s found and the man she has loved forever. I always get a little nervous when reaching the end of a series or trilogy that I’ve loved since I’ve been burned a few times by disappointing endings. 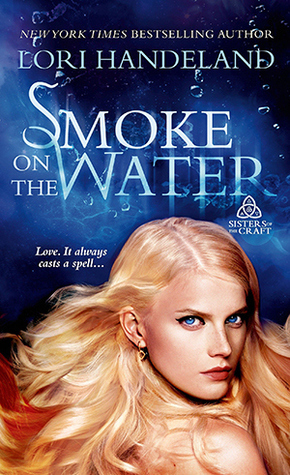 I’m happy to say though Smoke on the Water is an extremely satisfying conclusion to this enchanting trilogy. Willow has definitely had it the worst out of the three sisters. In and out of foster homes throughout her childhood, she tried to cope with her powers by using alcohol and drugs. She’s now in a mental institution because she aassaulted a man after having a vision of him trying to harm her. She has no idea how right she is. Of course there is absolutely nothing wrong with Willow and on some level she knows that. The problem is that she doesn’t understand what is causing her visions. Willow is a wonderful mix of vulnerability and hidden strength. She’s been hurt so many times, but she’s not bitter or jaded. While she’s trusting and still manages to see the good in people, she’s also more than capable of taking care of herself. Sebastian is a practical man who has never thought about the possibility of magic and witchcraft being real. He does know that there is some sort of immediate connection between himself and Willow, and it goes far beyond the usual one between doctor and patient. Because he’s a man of science he has some difficulty accepting Willow’s powers, but he’s never anything but supportive of her. Despite that instant connection between them, Sebastian spends the first half of the book trying to keep Willow at arm’s length–at least romantically speaking. Willow however immediately knows Sebastian is her soulmate and while I would normally find this somewhat annoying, given that Willow already knows him from her visions, I found this acceptable. I thought the additional powers were a little silly and the explanations regarding the how and the why a bit distracting, but it wasn’t enough to spoil my enjoyment of the overall story. My only other issue was with the final battle between the sisters and McHugh the villainous witch hunter. There’s a huge build-up to this yet when it finally happens I found it a slightly anticlimactic. Even so, it was nice seeing this truly nasty piece of work finally getting his just desserts. I’m a sucker for happy endings, and in Smoke and Water everyone gets theirs. There are no loose ends left so there is no doubt that this is the end of Willow’s, Raye’s and Becca’s story. There is however a teaser thrown in that gives you an idea of where Lori Handeland might be headed for her next trilogy. It’s left me wondering if perhaps some of the characters from this trilogy will be making mini-cameos. I’m definitely looking forward to finding out.